For those of you who live for live entertainment and have heard about the sophisticated, underground arts supporter The Art of Sound - you have to check this out, save the date and save your seats - only 20 complimentary spots available to the general public! 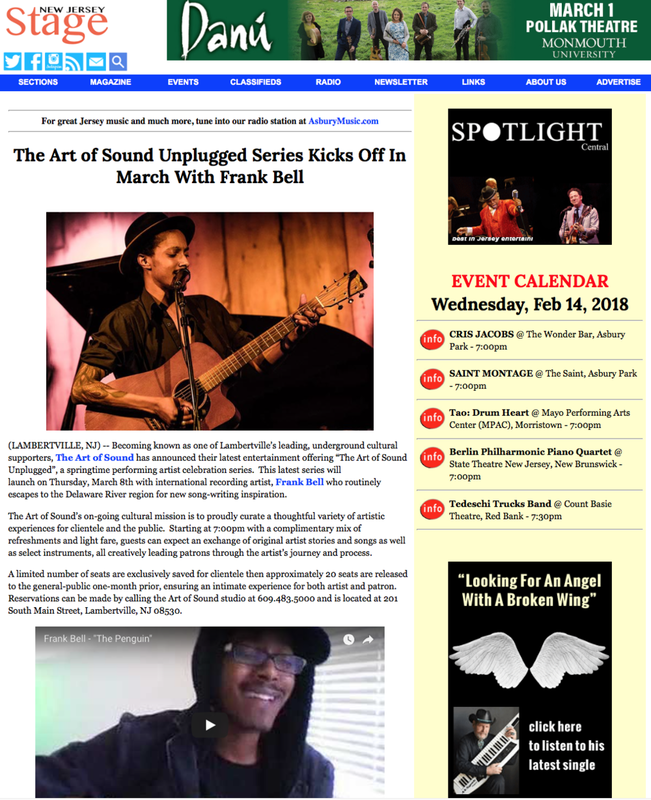 LAMBERTVILLE, NJ (2/13/18) – Becoming known as one of Lambertville’s leading, underground cultural supporters, The Art of Sound is pleased to announce their latest entertainment offering “The Art of Sound Unplugged”, a springtime performing artist celebration series. This unplugged series has been specifically designed to honor the live entertainment experience, amongst their 4,000-square foot, state-of-the-art, hi-fi studio, which additionally caters to the utmost presentation of premium, entertainment installation throughout the Northeast. 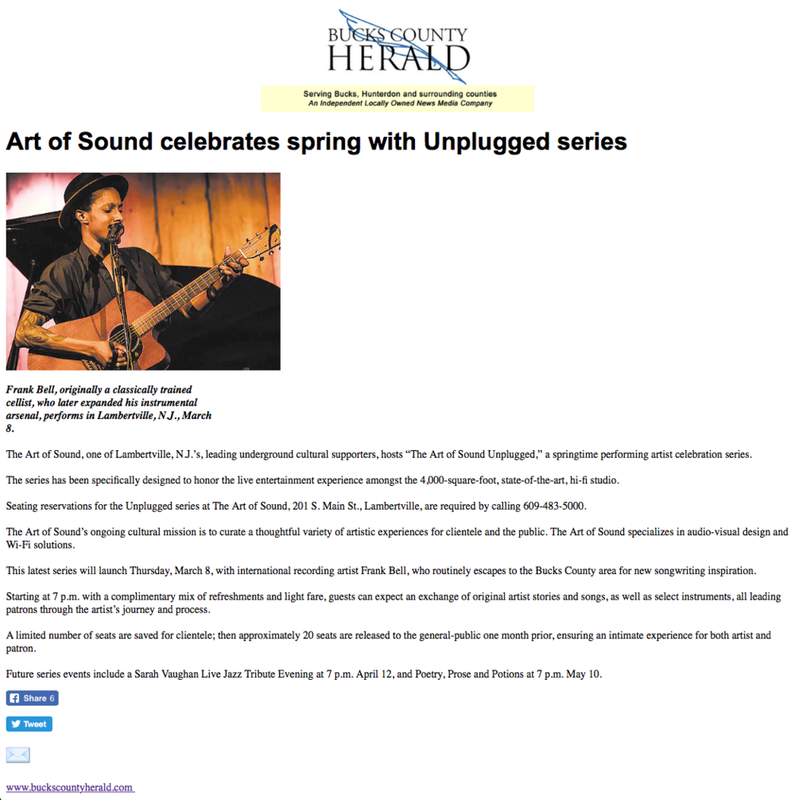 Seating reservations for the Unplugged series are required by calling The Art of Sound at 609.483.5000. The Art of Sound’s on-going cultural mission is to proudly curate a thoughtful variety of artistic experiences for clientele and the public. This latest series will launch Thursday, March 8th with international recording artist, FRANK BELL (FrankBell.net) who routinely escapes to the Bucks County area for new song-writing inspiration. Starting at 7pm with a complimentary mix of refreshments and light fare, guests of the March 8th evening with Mr. Bell can expect an exchange of original artist stories and songs as well as select instruments, all creatively leading patrons through the artist’s journey and process. A limited number of seats are exclusively saved for clientele then approximately 20 seats are released to the general-public one-month prior, ensuring an intimate experience for both artist and patron. Reservations can be made by calling the Art of Sound studio at 609.483.5000 and is located at 201 South Main Street, Lambertville, NJ 08530. Past programming includes the ever-popular and sold-out Lost Recording Vinyl Listening parties, Hammerstein fundraising screenings, as well as other exclusive, visual artist gallery shows. All Unplugged events include refreshments and light fare. More programming details regarding the remainder of the series for Jazz and Poetry nights TBA. In 2010 Frank was named the HATCH GROUNDBREAKING Musician (HATCHexperience.com), where he recorded a song with Matt Morris (Justin Timberlake, Kelly Clarkson, Christina Aguilera) on an original track aboard the John Lennon Tour Bus. Recent appearances on MTV, at the Sundance Film Festival, a Times Square NYE Concert, IdeaJam moderated by Ashton Kutcher, and Sold-out shows in Europe, continue to grow Frank’s awareness and fan base. Frank is also in tune with global needs. March of 2010, Frank could be seen on CNN, ABC World News with Dianne Sawyer, and other international news outlets, for a “We are the World” collaboration he participated in to aid Haiti relief efforts. In March of 2011 Frank led multiple ventures for Japan Tsunami Relief. He continues to work closely with non-profits and other charitable organizations as his career progresses, believing fully in social responsibilities and helping to raise awareness of what’s going on in the world. Since August of 2010, Frank found himself back and forth Bozeman, MT, where he teamed up with Producer, Deej Hofer to begin recording the highly anticipated full length LP “Everything Falls Into Place”, which was released October 11, 2011. 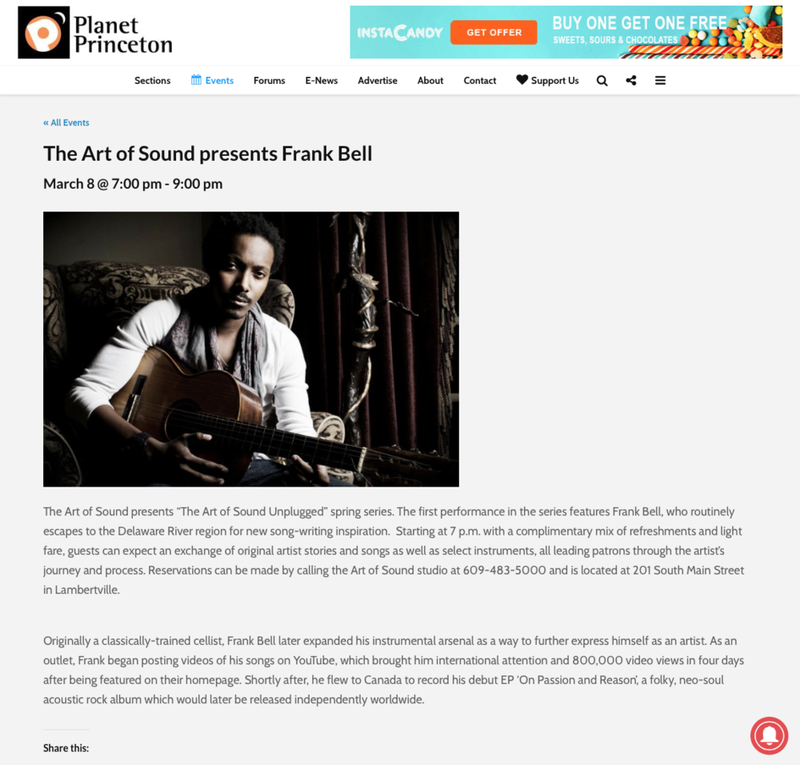 In March of 2014, Frank was announced as the official Music Brand Ambassador for Skype which since has led to his participation on a panel at TED 2014 with fellow artist Amanda Palmer, and Imogen Heap. In the following years, Frank turned his focus inwards, stripping down his sound and rediscovering the foundation of his passion: connecting with people through song. Spending extended periods of time in NYC, Boston, and at sea, Frank has been hard at work listening, building relationships, and refining his voice to speak to an increasingly diverse and disparate community. Always a heartfelt, insightful lyricist, his next big challenge is finding the words to match the world we live in today.